This single-layer card is all about masking! I used Shimmery White cardstock because it has a good weight for a single layer card and also has a nice smooth surface that inks up well. I protected the majority of the front of the card with scrap paper (masked it), leaving one strip ready for sponging with Pool Party, Marina Mist and Night of Navy. With the masking still in place, I started stamping my fish. Starting at the right of the card, I stamped a fish then covered with a mask that I'd prepared earlier (see below). Then I stamped the next fish, moved the mask onto that fish and stamped the next fish and so on. Tip: Remember that the image you mask will appear to be in front of what you stamp over it. 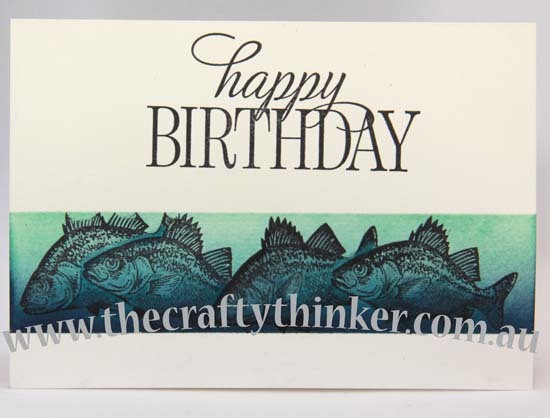 Once all my fish were stamped, I removed the scrap paper covering the card and stamped the greeting (from the exclusive Hostess set: Happy Birthday Everyone). Once the ink was nice and dry I added some clear Wink of Stella to the fish to make their scales glisten - sadly it doesn't show in the photo though! 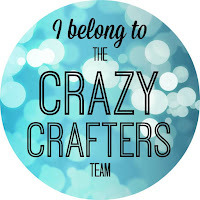 Stamp the image onto some scrap paper. I like to use a thin paper (like printer paper). Cut out the image - making sure to cut inside the lines. Dab or coat the back of the cut out image with 2-way glue and allow it to dry. Why do I need to cut inside the lines for a mask? Well, the edge of the paper makes the stamp "skip" ie it doesn't print in the area immediately around the edge of the paper. Cutting inside the lines allows for this unprinted zone and prevents a "halo" effect. Why am using 2-way glue and allowing it to dry? There are certainly other ways to go about it! However, this is what I have found works best for me. The 2-way glue is repositionable once it's dry and is only lightly tacky (if it seems too tacky, I stick it to my clothing a couple of times!) so it stays in place while necessary but is easy to remove without causing any damage to the project. I did a card similar to this years ago, but your coloring behind the fist and the masking to make the school makes me want to pull out the stamps again and make one of these!